Mister Rogers opens by explaining that he changes his shoes upon his arrival in order to feel more comfortable: "It's our time to get together. We might as well be comfortable together, you and I." Mister Rogers has brought with a collection of toy vehicles. He looks at each one individually talking about their names and purposes. Picture Picture shares images of various men and women who drive vehicles as viewers are encouraged to guess what kind of vehicles they operate. Mister Rogers sings Just For Once. In the Neighborhood of Make-Believe, Lady Elaine Fairchilde is lonely and looking for company but everyone in the Neighborhood is busy. As Mr. McFeely passes by, she tries to convince him to stay by telling him about her new display of delivery devices (which, of course, does not exist) but he, too, is busy. Mr. McFeely leaves his bicycle at the Museum-Go-Round as he makes a delivery to Daniel's clock. Handyman Negri happens buy just in time to interrupt Lady Elaine mischievously trying to find something to do to the bicycle that would make Mr. McFeely stay. Handyman Negri helps Lady Elaine chain the bicycle to the Museum-Go-Round when she explains that she was given instructions to keep it safe. When Mr. McFeely returns from delivering a toy truck to Daniel, Lady Elaine refuses to unchain the bicycle. 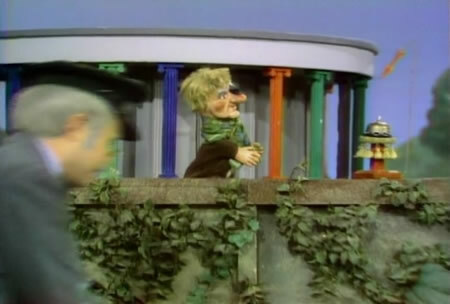 Handyman Negri realizes that Lady Elaine is lonely and offers to spend some time with her. Together they sing A Handy Lady and a Handy Man. 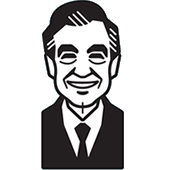 Back at the house, Mister Rogers talks about lonely feelings and thinks about a film showing a chain moving into various shapes. He concludes by lining up a few of the toy vehicles and taking one away. Viewers are challenged to guess which one was removed. As she hears Mr. McFeely approaching, Lady Elaine mistakenly looks towards Daniel's clock but Mr. McFeely arrives from the opposite direction. While this is clearly a puppeteering error on the part of Fred Rogers, he recovers nicely as Lady Elaine: "There you are. I thought you were coming from around that way. Oh, Mr. McFeely, your voice is deceiving." 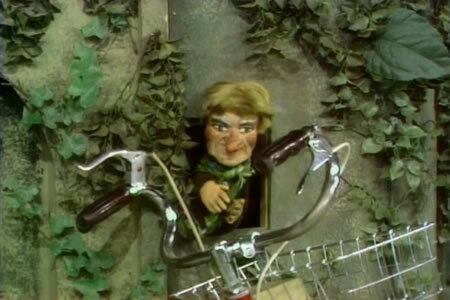 In order to get a better view of the bicycle as she considers her options for keeping Mr. McFeely at the Museum-Go-Round, Lady Elaine opens and peeks through a section of the wall in front of the Museum. Coming back from Make-Believe, Mister Rogers comments, "The very same people that you love a lot are the very same people that can make you mad a lot." Although not a direct quote, this is a line from Good People Sometimes Do Bad Things -- a song yet to be used on the Neighborhood program. The storyline from the Make-Believe portion of this episode is used in the pop-up book Time To Be Friends.